I have updated my Publications page to include a few new papers that have come out these last few months. These include some side projects (prevalence of equine encephalitis in Maine songbirds & fuel deposition rates in migrating songbirds) and a paper from my dissertation. I have also recently been elected to the council of the Wilson Ornithological Society. I look forward to continue to serve the society over the next three years. I have accepted a position as a post-doctoral fellow in the Biology Department at Canisius College in Buffalo, NY. While at Canisius I will continue to advance my teaching and research skills by developing upper-level undergraduate courses and mentoring research students. New publication on some collaborative work on Blackpoll Warbler migration is out. And available online. See also a bit of press we are receiving from The Auk: Ornithological Advances, National Audubon Society, and Bird Watching Daily. New pub is available online. This one is the first (of many?) from my dissertation work. Check it out here. The USM Migratory Bird Research Group (MBRG) has begun their spring migration banding in Cameron Parish Louisiana. See pictures below of the crew setting up the site. MBRG Graduate students Will Lewis, TJ Zenzal, and Kristen Covino (left to right). All the gear we brought down with us. The Gator was very helpful for carrying everything. TJ and Lauren setting up the banding tent. The whole gang after we finished setting up. Left to right, Shawn, Will, Kristen, TJ, Lauren, Keegan, and Sam. Keegan banding one of our first birds, a Northern Cardinal. Doing a little trimming for the high nets. High net all set up (but closed). I attended the annual meeting of the American Ornithologists' Union and Cooper Ornithological Society in Estes Park, Colorado from 22-28 September. While there I presented a talk on some of my dissertation work. 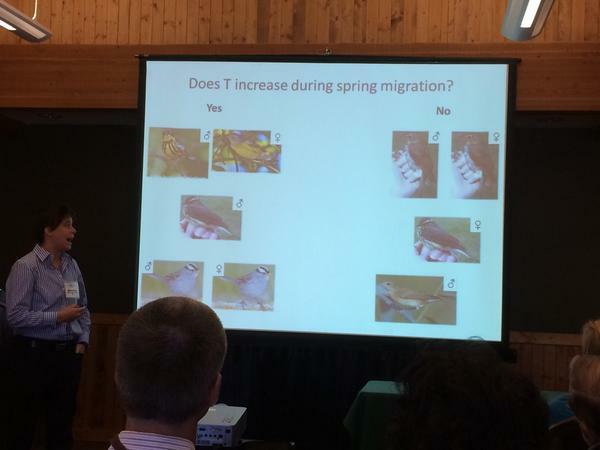 The talk was well received and the official Twitter feed for American Ornithology even Tweeted about the presentation. I just finished some field work sampling birds during their fall migration at Dauphin Island, AL in September and October. You can check out my blog posts about this work here.